Well, I think we had a high of 32 degrees yesterday, but that was in town, in Ennis. Below Ennis Lake in the Beartrap Canyon, where the sun didn’t make it above the surrounding mountains until after noon and where the wind was blowing 20 miles an hour, it may have hit 20 degrees at best. But, there was a goal yesterday, that being to lead Rick Bach, 24, a graduate from Syracuse’s journalism program, to his first Montana trout. Given that the Madison around town is gorged and that temperatures are typically lower the farther up the valley you go, I decided to try the Beartrap. By fishing the Trap, I figured, at least we would be close to a road that parrallels the upper portion of the river and that meant we could warm up as needed…in the Jeep Rubicon. 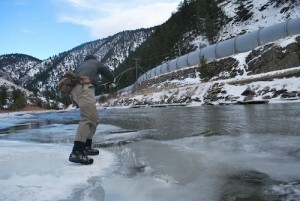 this portion of the state to catch a trout. And, previously, I’ve done well there with nothing more revolutionary than a GIE egg and a Brassie. Yesterday I didn’t even bother with the Brassie and just tied on GIE’s for Bach and me. I added a couple BB split shot and a strike indicator and we were off to the races. Fortunately, it didn’t take long and Bach, who was standing on a sheet of thick ice, was into a trout, a fairly minuscule rainbow, but a rainbow nonetheless. Goal accomplished. We were freezing but we didn’t quit fishing. My hands barely functioned and the guides on my rod, a new Loomis NRX (sweet stick! More on it later. ), were building solid with ice. 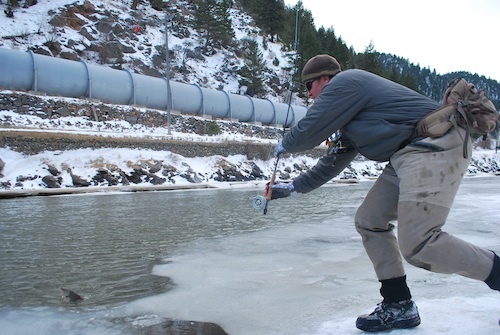 We chipped the ice from our guides, slid on the massive blocks of ice, constantly blew on our freezing hands, and cast as far as we could with a downstream wind blowing our fly line all around. I think I landed three rainbows and a brown before we called it quits and headed for the Bear Claw. While we sipped an instant warmer-upper—a shot of Old Crow—and followed it with a Rainier, I asked Bach about his current assignment, that being a trip around America, camping out of his Jeep and fishing wherever he can for whatever he wants. He’s penning his experiences for Outdoor Life, running it as a blog called, Fish America. All the posts are available at www.outdoorlife.com. According to Bach he’s stayed in 91 towns and fished in at least 25 states. His best meal during the trip was either the elk chili tacos in Arizona or the venison kielbasa and smoked salmon chowder I fed him last night. Or did we skip eating and just drink the High Life’s and Old Crow? Can’t remember for sure. I also asked Bach if he had any regrets about the trip and he noted that he didn’t make it to Alaska and that he shouldn’t have poured that final whiskey last night. Bach is trying to get back to upstate New York to visit family for Christmas and then his adventure will end. I asked him, “Would you do it again?” and he lit up and said, “Oh yea.” Right now, he’s talking to Outdoor Life and anyone else who will listen, trying to secure an assignment for 2011. This entry was posted in Montana, Northern Rockies and tagged Beartrap Canyon, Rick Bach. Bookmark the permalink.